Sigh. It’s true. We live in a throw-away clothing culture. We pick up inexpensive pieces, fully aware that they’ll wear out and need to be replaced next season. But with new interest in slower, sustainable living, choosing clothes that last, and maintaining them so they’ll last even longer, is gaining momentum. Which means patches are back! And I say hooray. 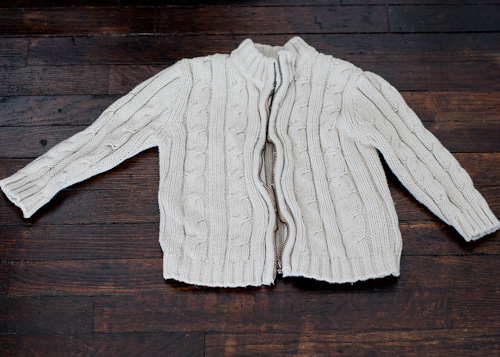 The thought of wearing a favorite piece of clothing over years instead of months is wonderfully appealing. And if your pockets are feeling empty after back-to-school shopping, the idea of dungarees that will handle a thousand hours on the playground, sounds especially smart. So here’s a useful patching guide that will aid even the non-sewers among us. 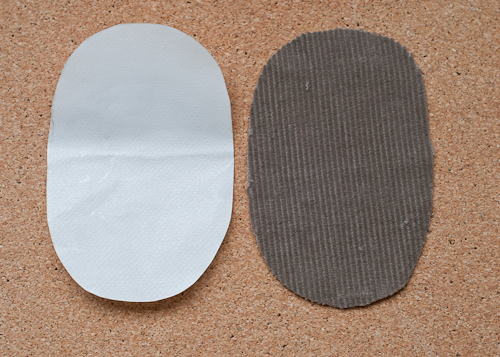 In this post, I’ll cover three patch types: A simple no-sew patch in both fabric and leather. A contrasting “under patch” that will add a nice texture — using iron-on fusible web and a few decorative hand-sewn stitches. 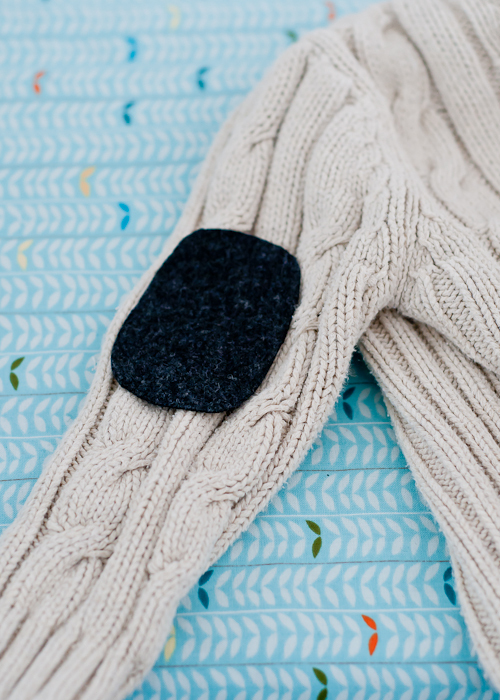 And third, a patch that works with knits (like sweaters) and can be hand-sewn in minutes. 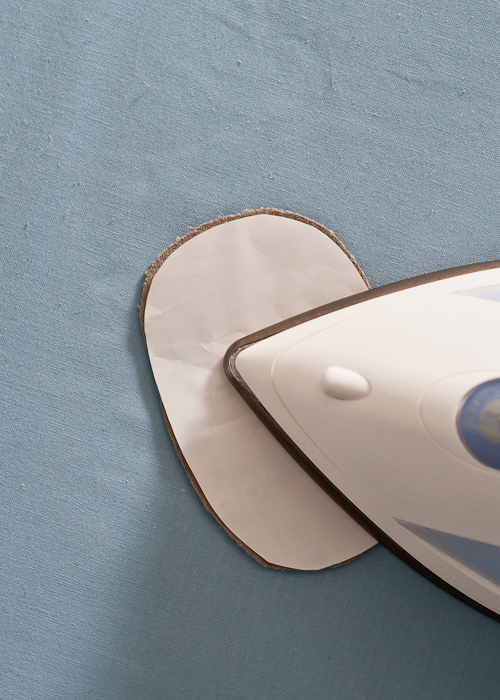 To start, you’ll need some type of iron-on interfacing. This helps strengthen the fabric as well as adhere it to the area being patched. 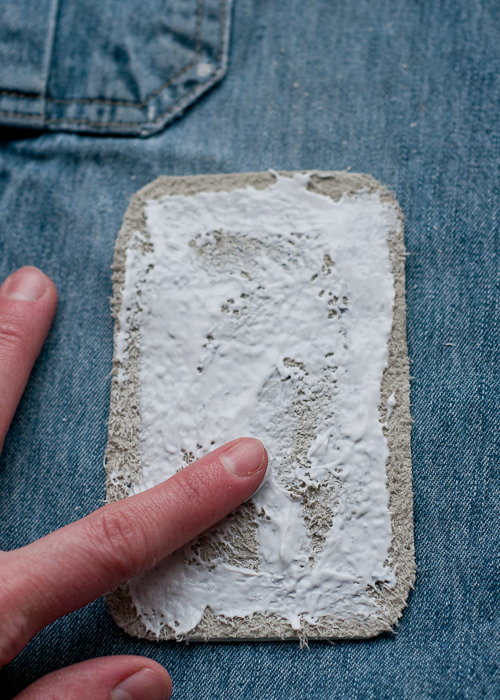 It’s basically a sheet of fabric glue that melts between your piece of clothing and patch when you iron it. I recommend Heat n’ Bond. Because it can be used on lower heat settings, doesn’t require steam, and works with a wide variety of fabrics, including synthetics. It’s also much stronger than traditional fusible web. 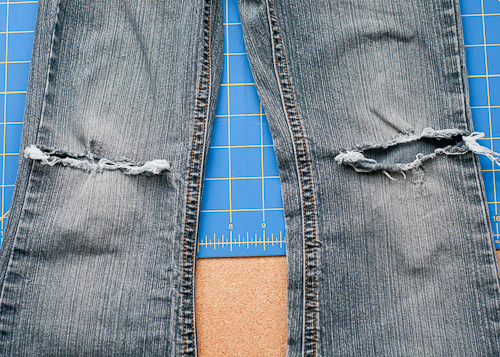 You’ll want to cut it exactly the right size, using the patch as a pattern. 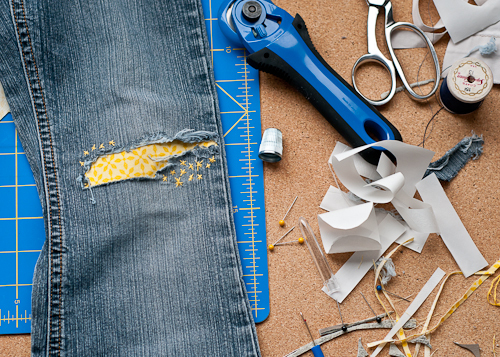 Remove any stray threads. Secret #1: If you need a really precise edge, skip the scissors and use a rotary cutter with a straight edge tool instead. 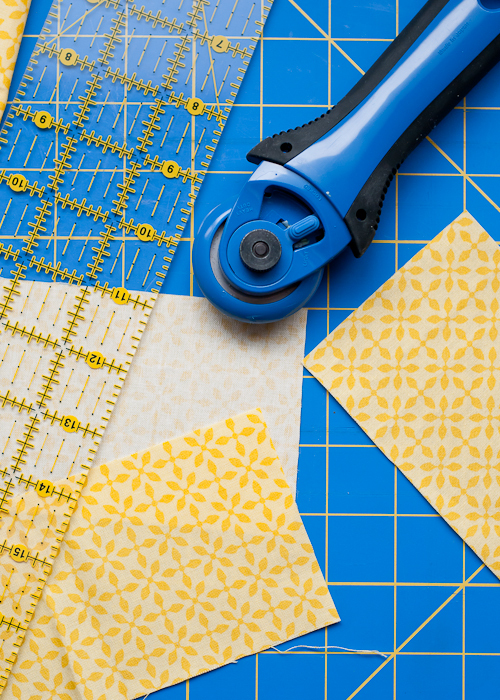 Rotary cutters are also good for thick, tough-to-cut materials, such as leather. The rough side of the Heat n’ Bond goes against the fabric. Iron until it is melted and has completely adhered. Let cool and remove the backing. 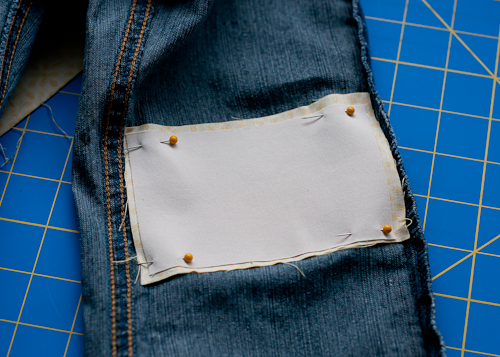 Position the patch where you want it on the pants or jacket or whatever you’re patching. It might be pretty easy to tell where the patch should go, but just in case, try on the clothing so you can place it correctly. 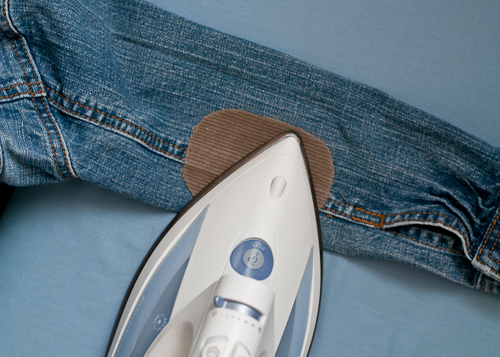 You will want to iron the outside and inside of the clothing to make sure the interfacing has totally melted. 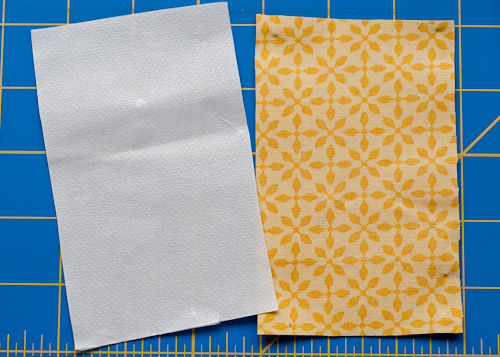 Secret #2: Corners and thicker areas are the trickiest parts. Double-check that these are totally adhered. If they’re not, add more heat. 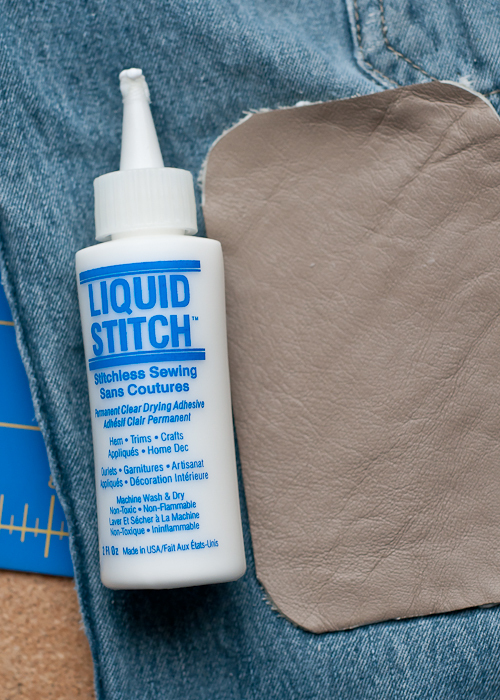 If you’re making a patch with leather instead of fabric, replace the iron-on interfacing with a strong fabric glue. 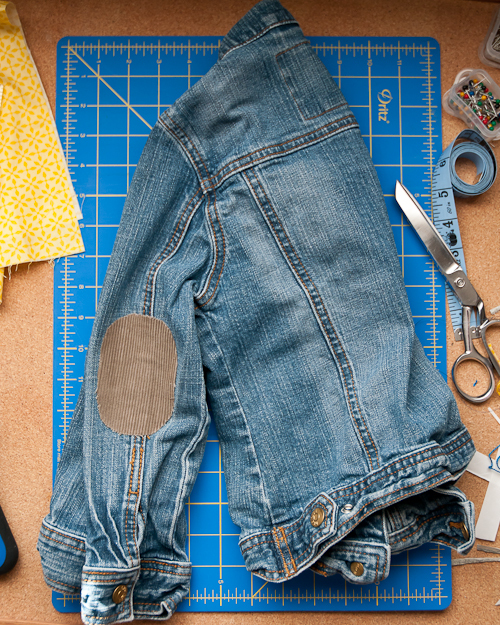 Cut the shape you want (perhaps hearts for some little girl jeans : ). I cut the basic rectangle from leather with the rotary cutter and rounded the edges with sharp scissors. 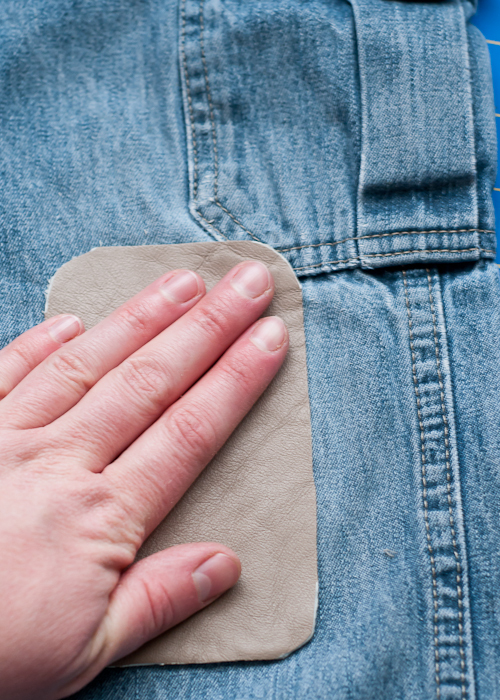 Place glue on the underside of the leather and place it on the pants. Press firmly and let dry. Easy as can be. 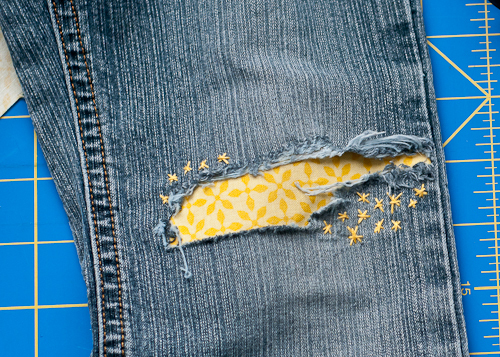 Sometimes you may want to use an under patch, like when holes develop in the knees of your favorite jeans. 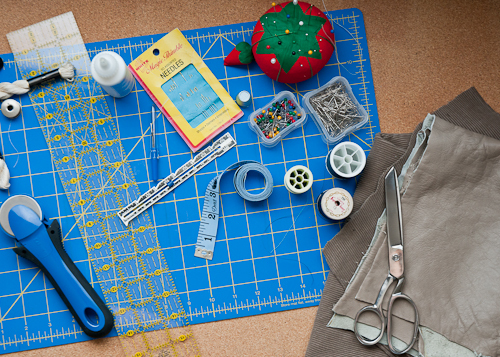 Pick a fun, contrasting fabric that will peek through the holes and a coordinated thread. 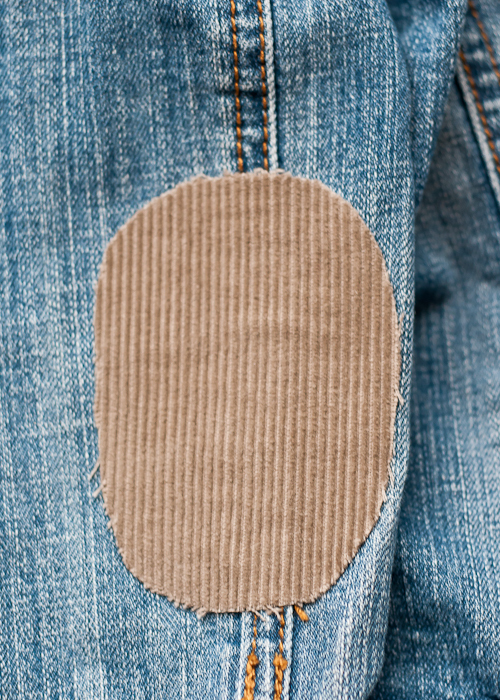 Cut a piece of Heat n’ Bond the same size as your fabric patch, leaving a hole in the center that will align with the hole in the jeans. 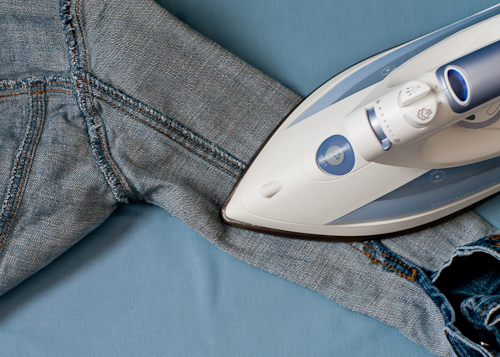 Pin it directly behind the holes in the knees and iron as directed. 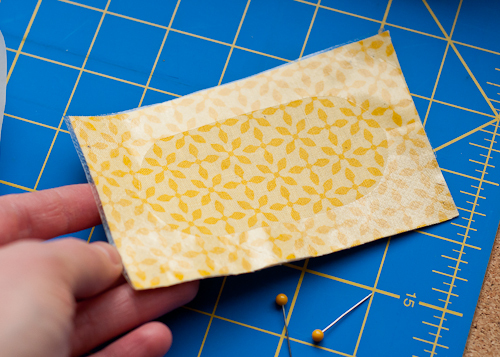 Secret #3: I wanted to make the fabric patch extra strong to ensure it would hold up longer, so I used Heat n’ Bond to attach some sturdy twill to the back of the fabric. As a final step, I used embroidery floss to make some stars that match the fabric. 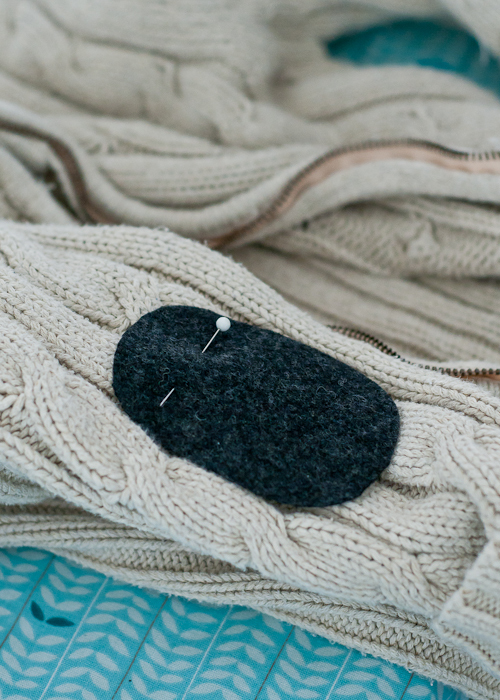 The hand-sewn stitches aren’t just cute, they also help keep the patch firmly in place. 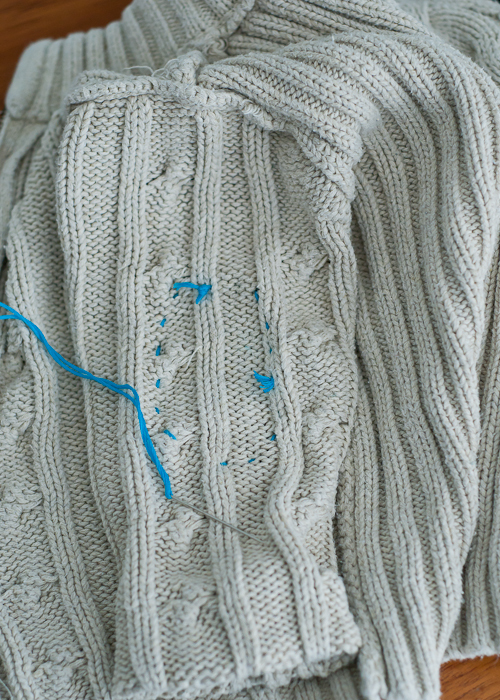 When patching a knitted clothing item, such as a sweater, you won’t want to use the heat n’ bond or glued or under-patching techniques above. 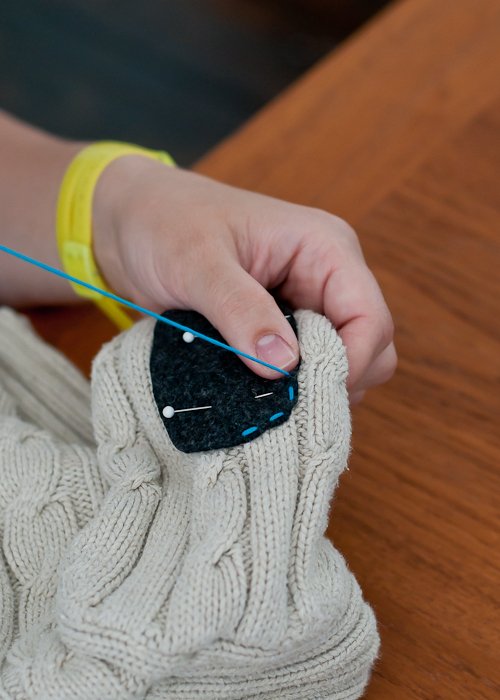 Instead, you’ll want to pick a sturdy fabric that coordinates with the sweater and use a simple stitch to sew it on. 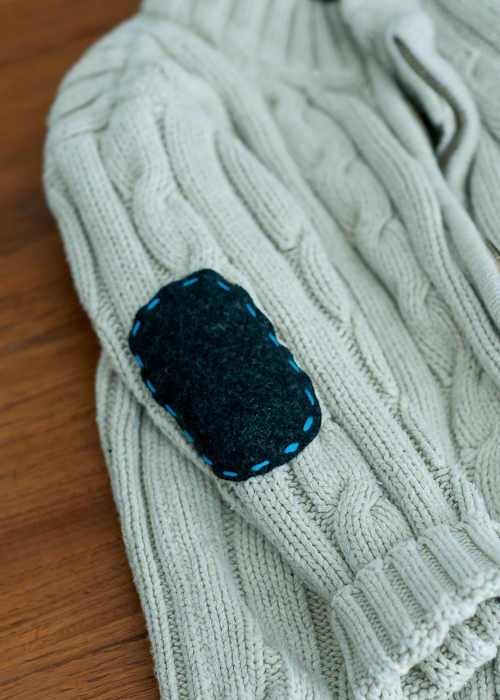 For the elbow patch pictured, heavy upholstery felt was used. Regular felt strengthened with interfacing will work too. Or even leather would also make a handsome patch. 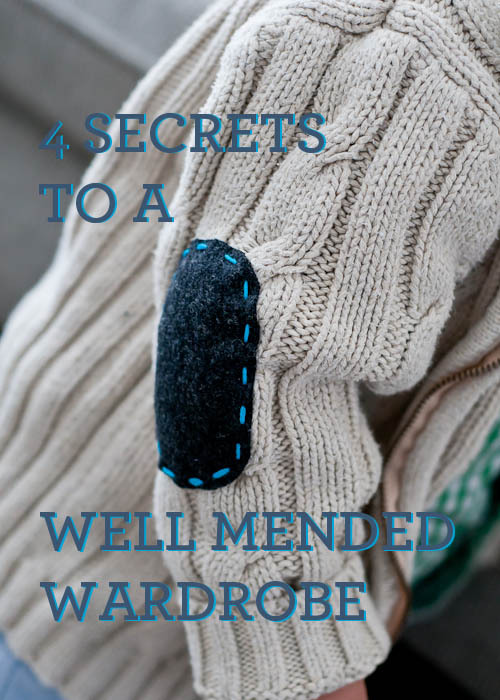 Secret #4: Sometimes, patches on knits are used to reinforce instead of repair. 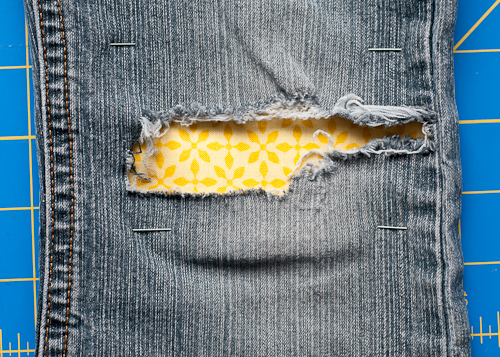 But, if you are using the patch to cover a hole, you will need to mend the hole a bit first so it doesn’t keep unraveling under the patch. Mark where the patch should go and pin it in place. 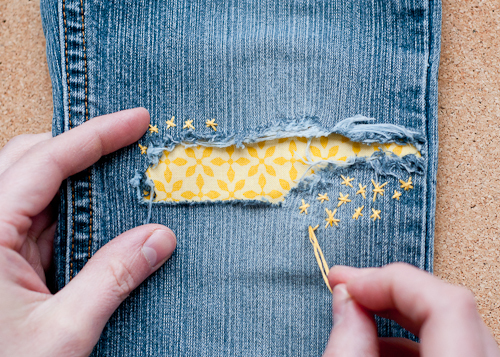 Use embroidery floss to make quick stitches all the way around the patch, making sure to tie strong knots at the beginning and end. Simple as that. Happy patching! And here’s hoping you’ll be wearing that favorite sweater for many, many years. Picnic Tips: Secrets For The Perfect Picnic! Comments Off on Picnic Tips: Secrets For The Perfect Picnic!